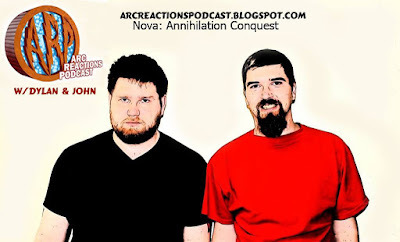 We discuss Nova: Annihilation Conquest. Topics include Nova, the worldmind, the phalanx and whether or not it is evil. Our next podcast will be our review of Spider-Man: Into the Spider-Verse (film) on December 16th. This week we have a new Trade your pick episode! If you are a new listener this is a new format to the podcast where I do a full show and review of one particular trade paperback from my collection. This episode I will be discussing Nova Vol. 2: Rookie Season TP. Enjoy! Individually they were just like those guys who like to hang around the comic book shop and talk comics but together they form the Earth’s Mightiest Podcast! In this episode we review Marvel Comics Avengers Books books of November 2015. 0:00:00 What did you do for Christmas? Super Podcasto Magnifico! Ep. #222: The Goddamned! Avengers! Web Warriors! F#%king Negan! On this podcast we talk about some Doctor Strange and The Walking Dead casting news. Then we review The Goddamned #1, All-New, All-Different Avengers #1 and Web Warriors #1. Exciting stuff. Listen in! Excited to see Negan on The Walking Dead? Head over to our podcast Facebook page and let us know. In this eXplicit, uncut and unedited episode of EMX we review X-Men books books of March 2015. Featuring guest host Matt Brakensiek. Disagreetings! Erik and James discuss Daredevil #14, Deadpool #44, New Avengers #32, and Nova #23. Also, Erik laments the end of Elektra with the series finale #11, and he jumps in on Secret Avengers #14 and has no idea what the hell is going on. Also our heroes weigh in on the recently-revealed cover of the All-New, All-Different Avengers team premiering on Free Comic Book Day. It’s a Friday night episode, so James was kind of sleepy and maybe a little crankier than usual. Comics and beers, cheers! Recorded on March 27th, 2015. Comic book round table. This week, we have – Miami Vice Remix #1, Batman & Robin #40, Invincible #118, Chrononauts #1, Nova #28 and more ………….